A half-century ago, three writers—all intimately familiar with the Native American culture of their time and locale—collaborated to produce a 450-page typescript of a study entitled Religious Customs of Modern Michigan Algonquians, together with sound recordings and photographs. Their 1959 work offered a detailed view of the life of Ojibwe and Odawa music, dance, myth, and ceremony at mid-century. Now framed by a substantive editor's introduction, and published for the first time in book form, this material offers a unique glimpse into a significant and largely overlooked era in the history of North American ethnology and ethnomusicology. 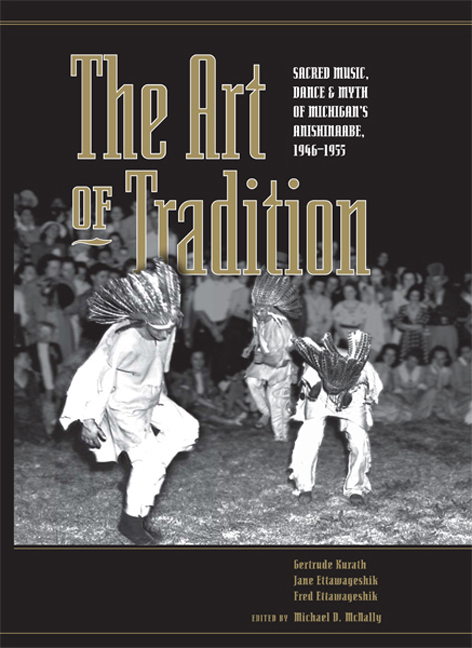 The Art of Tradition documents the complexity of Native life and culture at a critical juncture in Native American history, where the rekindling of pride in Native cultures characteristic of the later twentieth century met the generation of elders who spent their early years speaking Native tongues but who came of age in boarding schools and amid strong pressures of assimilation. Because this period was deemed by most ethnographers of the time to be one of "acculturation," marking the end of traditional Native cultures, the authors' appreciation for the integrity of mid-century Native culture stands out markedly from other scholarship of the day. The songs, dance steps, and stories collected here are evidence of the artful work of maintaining and breathing new life into traditions, often in contexts that seem anything but traditional, by indigenous elders and artists. As the editor notes, there are no "Native informants" in this study, only collaborators whose lives are shown to be as resilient as the repertories they performed. The Art of Tradition is itself a demonstration of the improvisation and resourcefulness that ensured the continuity of Native communities. In documenting the rich ethnographic material with refreshingly little analytical overlay, it serves today as a valuable primary resource on Native religions and cultures. Michael D. McNally is Associate Professor of Religion at Carleton College. Gertrude Prokosch Kurath (1903–1992) graduated from Bryn Mawr College and studied music and dance at the Yale School of Drama. Between 1923 and 1946 she taught, performed, produced, and choreographed modern dance. In the mid-1940s, she began to study the dance and associated musical traditions of the Anishinaabe and other Native peoples. She performed under the name of Tula. From 1958 to 1972 she was dance editor for the journal Ethnomusicology. Jane Ettawageshik (1915–1996) graduated from Barnard College and earned an M.A. in Anthropology from the University of Pennsylvania. Fred Ettawageshik (1896-1969) was a leader of the Odawa community on Little Traverse Bay, Michigan. He was a fluent Odawa speaker who was educated at the leading Native American boarding school of its time, Pennsylvania's Carlisle Institute. He was an active member of the Michigan Indian Defense Association.